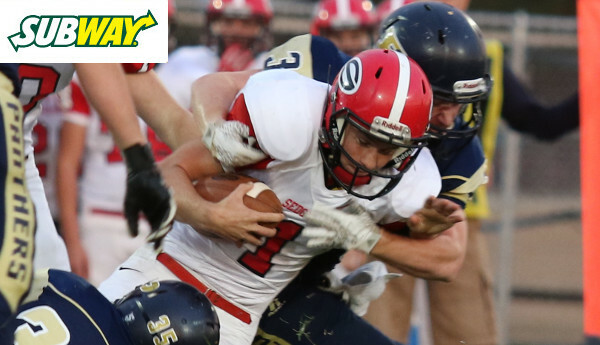 On the Week 6 edition of the Subway Friday Fresh Take, we’ll recap some of the state’s top games featuring ranked opponents and highlight a few other notes from Friday’s action. The ranked showdown in Class 2-1A lived up to its billing on Friday night. Second-ranked Sedgwick fell behind 24-0 in the first half only to rally for a 34-32 win at No. 4 Phillipsburg. The Cardinals needed a touchdown pass from Grant Hilliard to Nate Werner in the final minute to get within 24-7 at halftime. Phillipsburg eventually led 32-14 in the third quarter when Sedgwick began their run of 20 consecutive points to overtake the Panthers. A touchdown from Hilliard to Nathaniel Backer cut the lead to 32-21. The Cardinals scored early in the fourth quarter to pull within 32-28. Less than three minutes later, Hilliard hit Werner on a 50-yard gain to set up a touchdown run by Tyler Griggs. Sedgwick had rallied from down 18 to take a 34-32 lead. Phillipsburg would fumble on its next possession and later the Cardinal defense would force a Panther punt to help secure the win. Scott City went on the road to Ulysses and shut out the Tigers 35-0 to win the Greater West Activities Conference title. The Beavers got all the scoring they would need on a Cooper Griffith touchdown run late in the first quarter for a 6-0 lead. Quarterback Bo Hess played well, completing 7 of his 10 pass attempts for 162 yards and three touchdowns. Hess threw touchdown passes to Drake McRae and Justin Faurot in the second quarter to lead 21-0 at halftime. Griffith scored again late in the third quarter for a 28-0 lead. Hess hit McRae again in the fourth quarter to complete the scoring for Scott City. Griffith rushed for 171 yards and those two scores, while McRae had six receptions for 154 yards and two scores. The Scott City defense held Ulysses star running back Ian Rudzik to 29 yards rushing on 15 attempts. Rudzik entered the game averaging 246 rushing per game. St. Thomas Aquinas trailed 13-7 at halftime at Class 6A No. 4 Blue Valley, but the Saints dominated the second half in winning 35-13. Aquinas, ranked No. 3 in Class 5A, rushed for more than 480 yards on the night. Four different Saints scored touchdowns in the second half, providing a perfect example of how Aquinas spread the ball around on Friday night. Sam Ramaekers broke a 57-yard touchdown run in the third quarter to give Aquinas a 14-13 lead. Less than two minutes later, Duron Lowe broke outside and sped away from the Tiger defense for a 68-yard touchdown run and a 21-13 lead. Blue Valley continued to struggle on offense, and Aquinas quarterback Karter Odermann added a short touchdown run in the fourth quarter to push the lead to 28-13. James Cosentino later got into the end zone from 14 yards out for a 35-13 advantage. Cosentino led Aquinas with 153 rushing yards and that touchdown on 26 carries. Ramaekers chipped in 130 yards and a score on 14 attempts. Lowe carried just six times, but totaled 93 yards and that long touchdown run, while Odermann scored twice to go along with 58 rushing yards. The Aquinas defense held Blue Valley’s three-headed rushing attack of Colton McCumber, A.J. Totta, and William Evans to 166 rushing yards on the night. McCumber rushed for 90 yards and a touchdown, while passing for 140 and another score. Wayne Shirley connected on a 27-yard field goal in overtime to lift Junction City to a 17-14 win at Manhattan. Manhattan got the first possession in overtime and appeared to score on a fourth-and-1 sneak by quarterback Ian Trapp. Trapp, however, was ruled down and the Indians came away without points setting up Shirley’s winning kick. Manhattan led 14-7 at halftime and had much more success moving the ball than Junction City on the night. However, late in the third quarter, Junction City’s Timothy Bell returned a Manhattan fumble 60 yards for a touchdown to tie the game at 14. The Blue Jays remain unbeaten on the season and reclaim the Silver Trophy back from the Indians. Friday’s final marks the seventh consecutive time the game has been decided by fewer than 10 points. In the Kpreps’ Fan’s Choice for statewide Game of the Week, Burlingame went on the road and picked up a key 48-26 victory over Rural Vista in 8M-I, District 3. Leading 6-0, Burlingame intercepted a Rural Vista pass and converted that turnover into points shortly after for a 14-0 lead. Things got worse for the Heat in the second quarter as they were whistled for intentional grounding in the end zone resulting in a safety and a 16-0 deficit. Burlingame returned the ensuing kickoff for a touchdown and a 22-0 lead. Rural Vista pulled to within 22-6 at the half before Burlingame scored twice out of the locker room for a 34-6 lead. The Heat scored consecutive touchdowns to pull to within 34-20 at the end of the third quarter, but the Bearcats expanded that lead to 28 with two more touchdowns in the fourth quarter. Blue Valley North clinched at least a share of the Eastern Kansas League title with a 42-7 win over Gardner-Edgerton. A week after rallying late to upset Blue Valley 28-27, the Mustangs jumped out to a 28-0 lead in rolling past the Trailblazers. Quarterback Joey Dolan was nearly perfect in completing 15 of 16 passes for 246 yards and five touchdowns. Josh Pederson caught five passes for 99 yards and two scores, while Alex Blake’s four receptions covered 65 yards and reached the end zone twice. Last week’s fourth-quarter hero Charlie Brock added three receptions for 54 yards and a touchdown tonight. The win by the Mustangs allows them to finish 5-1 in the EKL and evens their league record with that of Bishop Miege. The Mustangs and Stags did not play this season. St. Thomas Aquinas sits at 4-1 in the EKL with games remaining against Blue Valley West and Blue Valley Southwest. On Thursday night, top-ranked Columbus scored twice in the final six minutes of the game to overtake St. Mary’s Colgan, 43-40. The Titans took their first lead with 5:40 remaining on a short touchdown run by Jace McDown. After a Panther punt, Columbus scored on a 35-yard touchdown run by Keenan Stanley to lead 43-33. But Colgan would respond with a touchdown pass from Ryan Cedeno to Joe Battitori to pull within 43-40 with 2:35 remaining. The Panthers ultimately got the ball back with 25 seconds remaining and reached midfield before running out of time. Colgan led 26-15 at halftime behind an effective passing game. Cedeno completed 17 of 24 passes for 370 yards and three scores. He also rushed for a touchdown. Battitori rushed for 123 yards and a score, while Sawyer Esch caught five passes for 187 yards and a score. McDown rushed for 255 yards and four touchdowns on 27 carries for the Titans. Louisburg won this Frontier League battle featured on Kpreps Kansas Game Day with a 43-28 victory. The Wildcats opened up a 14-0 lead on an Austin Terry touchdown run and a pass to Mitchell McLellan. After a De Soto answer, Louisburg scored before halftime for a 21-7 lead. Louisburg extended their lead to 28-7 when Terry hit Cole Kramer on a 72-yard touchdown pass. De Soto scored to pull within 28-14 at the end of the third quarter. Louisburg would add a pair of fourth-quarter scores for a 43-14 lead. Korbin Hankinson scored from 20 yards out, while Terry connected with McLellan on another long touchdown pass . Hesston got a Zach Esau touchdown run in the third quarter to top Pratt 14-7. Esau scored on a 1-yard run early in the third quarter to put the Swathers up by a touchdown. Pratt began the scoring in the first quarter on a touchdown run from freshman quarterback Travis Theis. Hesston responded when Esau then hit Scott Duerksen on a 24-yard touchdown pass to tie the game at 7. Duerksen made a ridiculous one-handed catch in the end zone for the score. Esau ended a pair of Pratt drives with interceptions on defense to help Hesston move to 5-1. The Jefferson County North Chargers evened their record at 3-3 with a dramatic 22-20 win over Christ Prep Academy. Trailing 20-14, Charger quarterback Bryce Noll hit Brayden Summers on a 30-yard touchdown pass with 12 seconds remaining to tie the game at 20. The Chargers then added the two-point conversion for the 22-20 win. Northern Heights shut out Marion 20-0 in the second half in upsetting the fifth-ranked Warriors, 34-24. Tucker Litke tossed a pair of touchdown passes in the third quarter to give the Wildcats a 27-24 lead. Marion struggled to get past Chase County in last week’s 14-13 win, but the Warriors did not have an answer in the second half on Friday. Caldwell led wire-to-wire in upsetting 8M-II No. 5 Pretty Prairie, 48-24 on Friday night. The Bulldogs entered the game having surrendered only eight points all season to go along with four shutouts. Caldwell quickly surpassed that total with a pair of first-quarter touchdowns. The Blue Jays led 26-24 at halftime, and shut out the Bulldogs in the final two quarters to pick up their second win.